please fill out the paperwork to the right! Adults (18 & older) and parent volunteer coaches are needed for each youth sport. Coaches may request to coach with another coach in order to work out personal schedules and needs. If you are interested in helping, please fill out a Coach's Application along with a Child Abuse and Criminal Background Check Forms at the office or to the right! Please turn in your application and paperwork for the sport you wish to coach in before the registration deadline! Coach's must attend the appropriate coach's meeting (times and dates to be announced) and become certified through the National Youth Sports Coaches Association (NYSCA). Coaches may also watch tapes during office hours: Mon-Fri, 8:00 a.m. to 4:00 p.m.
Certain Professions and Occupations maybe waived from getting certified, contact the office for more information! 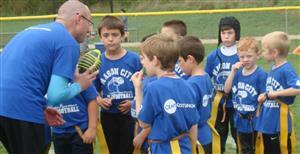 All of the MC Recreation Department's Youth Sports Programs rely heavily on Volunteer Parents to coach. If a volunteer does not step forward to coach, staff will arrange practices and parents will be responsible for games. Your child's sports experience may not be as enjoyable as if you or a volunteer parent were coaching full-time. A parent's meeting will be held and parents will sign-up for game dates. At the end of each sport coaches vote on sportsmanship for the league, at the end of the season a coach is chosen to be coach of the year!